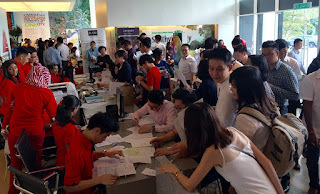 Mah Sing Group’s Cerrado Residential Suites Tower A saw all 404 units taken up during its launch at Southville City’s Sales Gallery and Show Village here over the weekend. Cerrado is part of Mah Sing’s Southville City, a 428-acre freehold township comprising a total of seven phases with a gross development value (GDV) of RM11.1 billion. Cerrado consists of four towers with 404 units of serviced apartments per tower. The units come in two layout options, 656 sq ft with two bedrooms and 825 sq ft with three bedrooms. Prices start from RM357,000 and the units are slated for completion in 2020. Cerrado also offers 48 retail shoplots and 10 units of poolside cabanas. Both are priced from RM1.1 million where the former offers an average built-up of 1,400 sq ft while the average built-up for the latter is 1,800 sq ft. The launch of Cerrado’s Tower A has seen Southville City lock in RM1.77 billion over the last two years. Two weeks ago, Mah Sing had launched the final tower of Lakeville Residences in Taman Wahyu which attained a 92% take-up rate. Its group managing director Tan Sri Leong Hoy Kum said: “Cerrado (as well as Southville City) will be a highly accessible location once the direct interchange from the KL-Seremban Highway into Southville City is completed by end-2017. Homes at Cerrado are also equipped with value-added features such as a keyless digital lockset and a designer kitchen cabinet inclusive of an induction hob and hood. Cerrado Residential Suites are part of the third phase of Southville City after Savanna Executive Suites and Lifestyle Shops (first phase) and Avens Residence landed super link homes (second phase). To date, Mah Sing has locked in more than 3,800 units from the launch of these three phases. According to Mah Sing, registration for Cerrado Tower B will begin at its official launch to be held on Aug 13 and 14. Cerrado’s launch also marked the group’s collaboration with BSN’s Youth Housing Scheme where eligible young married couples will be entitled to up to 100% of home loan financing between RM100,000 to RM500,000. Successful applicants of the scheme will receive additional financing of up to 5% of the purchase price for the cost of the mortgage reducing term assurance (MRTA) or mortgage reducing term takaful (MRTT). The government will also offer additional aid of monthly disbursements of RM200 for the first two years.